It is a time of violent social upheaval as Japan enters a new era in the 1860s. Samurai from all walks of life travel to Kyoto in hopes of joining the Shinsengumi, a band of warriors dedicated to the Shogunate bakufu system. In order to avenge her father and brother, Tominaga Sei disguises herself as a boy, takes the name “Kamiya Seizaburo,” and joins the Shinsengumi. Aspiring to be a true bushi (samurai or warrior), Kamiya trains under Okita Soji, the young man she loves and the only person in the Shinsengumi who knows Kamiya’s true identity. Also, before they were Kondo Isami, Captain of the Shinsengumi, and Hijikata Toshizo, Vice-Captain of the Shinsengumi, they were the rival youngsters, respectively, Katsugoro of Kamiishihara and Toshi. Now, return to their early years at ambitious teens. THE LOWDOWN: It has been a year since I last read the Kaze Hikaru manga. It was a year ago that the previous graphic novel, Vol. 23, was published. I enjoy reading Kaze Hikaru, but rarely think about it when I am not reading it. However, this new volume will be hard to forget. 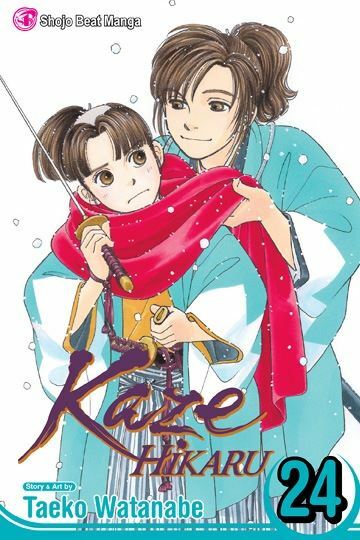 In Kaze Hikaru Volume 24, creator Taeko Watanabe toys with the idea that not one, but two characters could be forced to kill themselves – the two leads. This is not a gimmick, as a major character previously did commit “seppuku,” (the late and beloved Yamanami Keisuke, Vice-Captain). I knew it would not happen, but part of me was still worried. There is also an excellent flashback sequence that is as enthralling as the suicide threat is scary. The back story looks to continue next volume, so a part of my imagination will stay with Kaze Hikaru. Admirers of Japanese historical fiction should also engage their imagination with this excellent manga.